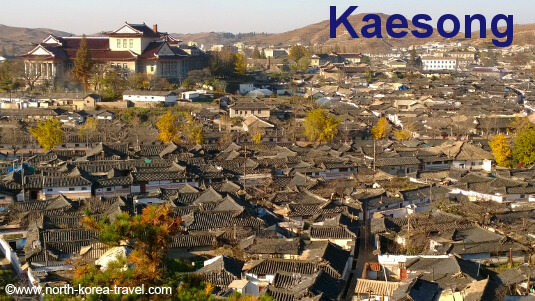 Kaesong is located only 8 km north from the DMZ (Panmunjom) in North Korea. This historical city was the capital of Koryo (Goryeo, 918-1392), one of the strongest kingdoms on the Korean peninsula. 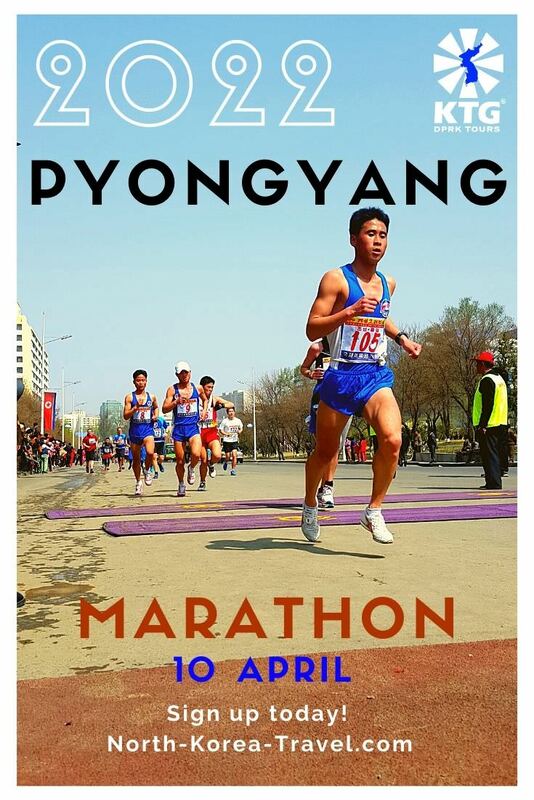 The 198 km drive from Pyongyang through empty highways will offer remarkable sites of the North Korean countryside and glimpses of people's daily activities outside of the capital. 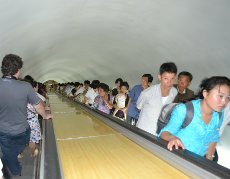 South Koreans are also allowed to go to visit, albeit just for a day and in spite of not being able to go to Pyongyang. They can be spotted on modern buses and with guides in blue outfits wearing headsets, walkie talkies in hand. UPDATE: this was initially written in 2008. 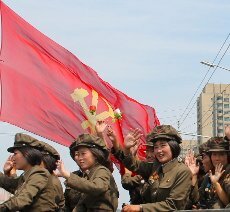 South Korean citizens have not been able to go to as tourists to North Korea since. They used to be allowed to go there and to Mt. Kumgangsan but that has no longer been the case since 2008. 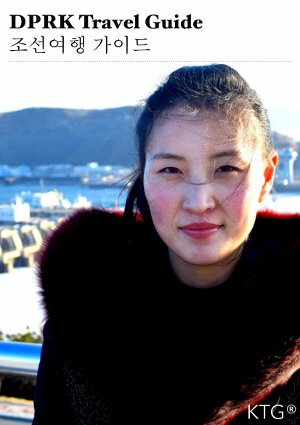 It is possible for us though to arrange for Westerners to go to Kumgangsan. View of the Old Part of Town. 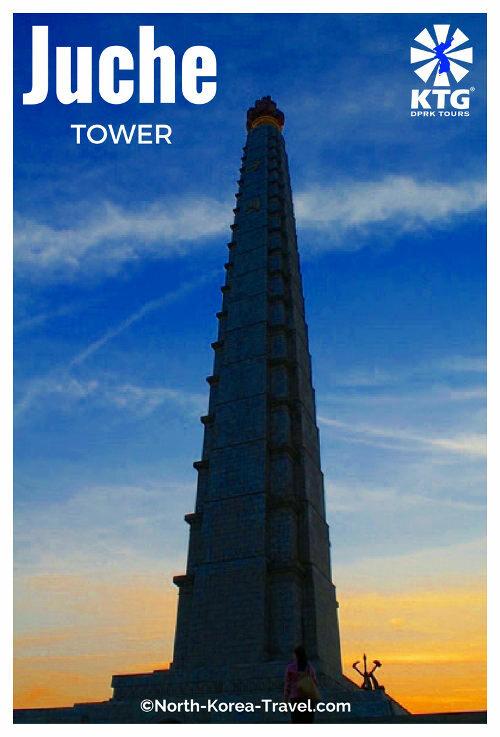 Unlike most cities in Korea, Kaesong was not destroyed during the Korean War. 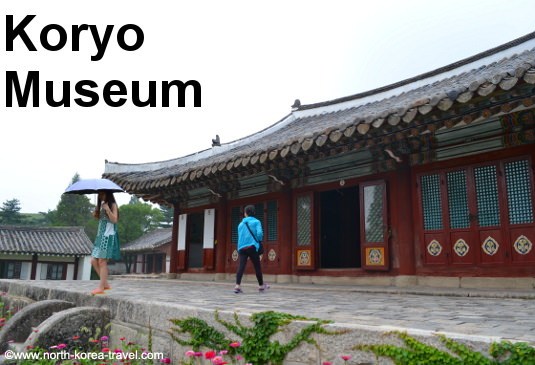 The former capital of Koryo is renowned in the DPRK for its Ginseng and for hosting the Koryo Museum, which in the 10th century became the highest educational institution of Koryo holding up to 2000 students. It now holds ancient items of such dynasty. Its gardens and courtyards offer are truly relaxing. 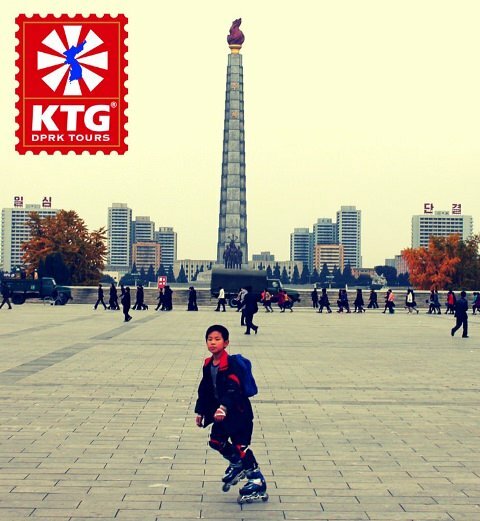 There is a stamp shop outside the hotel where we can not only purchase a wide variety of DPRK stamps, but also artwork, postcards and coins. 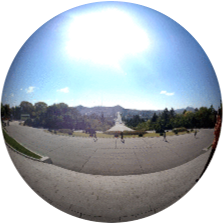 The twin tombs are one of the best preserved historical sites in DPRK. King Kongmin was King of the Koryo Dynasty and started building this tomb when his Mongolian wife passed away in 1365. We will be able to see too the tombs of generals and officials of the Koryo Dynasty on several hillsides as we drive to this site which in 2013 was declared a UNESCO World Heritage Site. Image Above: The tombs of King Kongmin and his Mongolian Wife. This tombs have undergone relatively little restoration and the place was declared UNESCO World Heritage site in 2013. 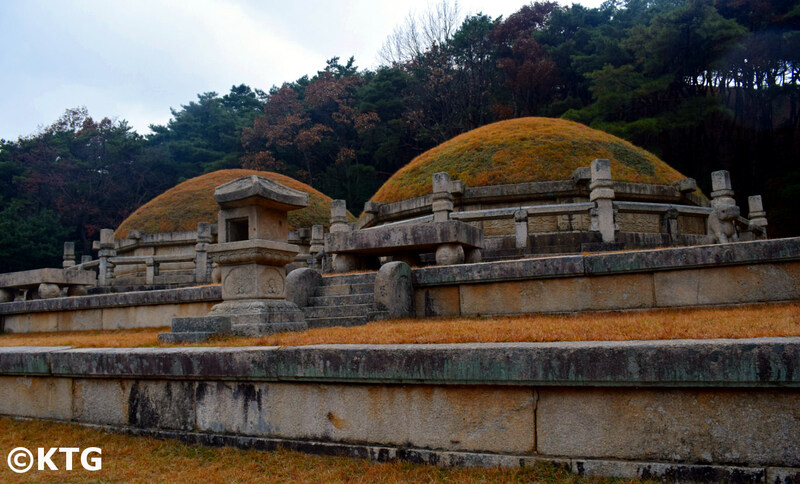 Although much older than the tomb of King Kongmin, this Mausoleum was restored in 1994 and therefore shows much less of its original appearance compared to the Mausoleum of King Kongmin. 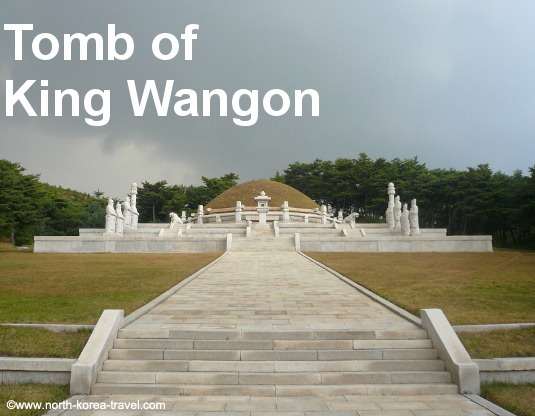 King Wangon (also spelled Wan Kon) was the founder of the Koryo Dynasty and died in 943. We actually drive by here when visiting the Tomb of King Kongmin. As we approach Kaesong we can see the giant bronze statue of President Kim Il Sung overlooking the whole city and the surrounding region. Spectacular views of the city are offered from here and the entire old part of town can be seen from the hill too. Stopping for lunch at this historical city is always a treat with separate dishes being served in individual covered metal bowls. A few hundred metres up the road from the restaurant yet another impressive statue of President Kim Il Sung looms on a hill over the entire city. 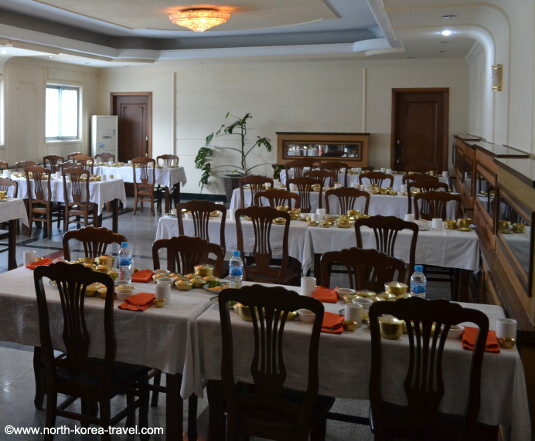 When we stay in Kaesong overnight we stay at the Minsok (meaning Folk in Korean) Hotel. 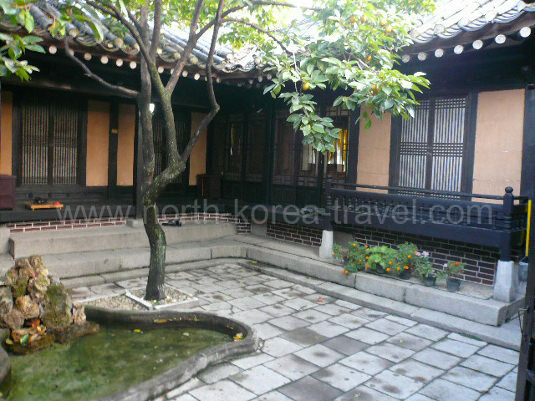 This is a traditional Korean Courtyard Hotel where we eat and sleep on the floor as per Korean tradition. The hotel is divided into courtyards which are surrounded by rooms where we stay. Chatting in the courtyard at night with other travellers and our guides is a very pleasant experience especially on clear nights where the number of stars above in the light-pollution free skies offer a great night scenery. 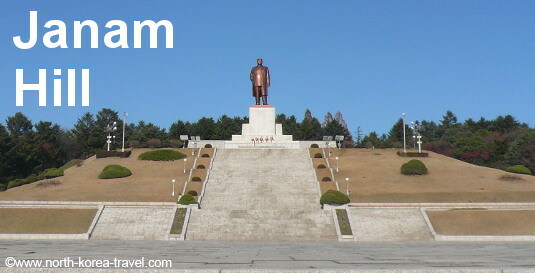 The statue of President Kim Il Sung can also be seen lit at night, at a distance, from the hotel compound. 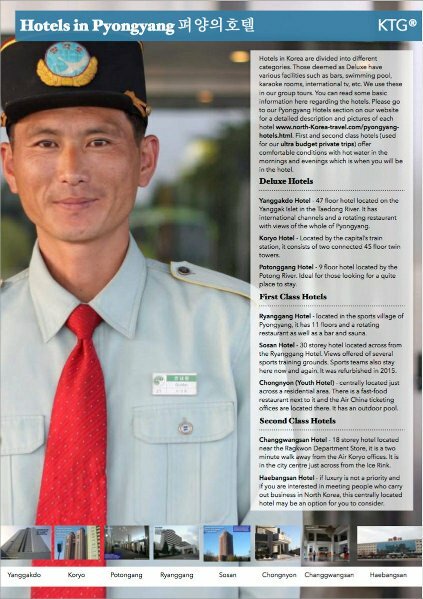 Please click here to see what other areas you will be able to visit other than Kaesong while visiting North Korea.